The example above shows a TODAY screen taken from the app, displaying the generation mix for the selected location around Bude on the Cornwall/Devon Border in the South West of England and supplied by our Pyworthy Bulk Supply Point. The date of the example is February 1st and the snapshot was taken at 10am, as shown by the triangular marker above the time axis at the very top. The graph at the top shows the demand at that substation and the overall height of each hourly bar indicates the size of the demand. This is a winter “demand profile” and is low through the night (on the left) and picks up after 6am, but then remains reasonably constant through the afternoon, reaching a peak around 5 - 6 pm when everyone is arriving home from school and work and getting their evening meal ready, turning on lights and heating etc. The demand falls through the evening as people relax more and head for bed. The coloured segments of each bar correspond to the portion of demand supplied by the different sources, green for renewables, purple for fossil fuels, lime green for nuclear, and other sources in blue-grey. The numbers in the table on the right below the graph show the percentages of each generation type at the selected time. It is possible to click on the graph (when it is live in the app), to show the breakdown table for each time bar. You can also “SHOW MORE” (top right of the table of percentages) to get the actual generation values in Mega Watts further, broken down by specific sources active for this location and at this time (Solar, Wind, Biomass etc). The circle with the number at its centre below left of the graph is the measure of carbon intensity for the selected time bar. The number is in grams of Carbon Dioxide created per kilo Watt hour of energy generated, and a number between 0 and 179 is currently considered good and would display in green. Values 180 – 279 are in amber and above 280 are in red meaning that the current mix is considered less good in terms of carbon intensity. 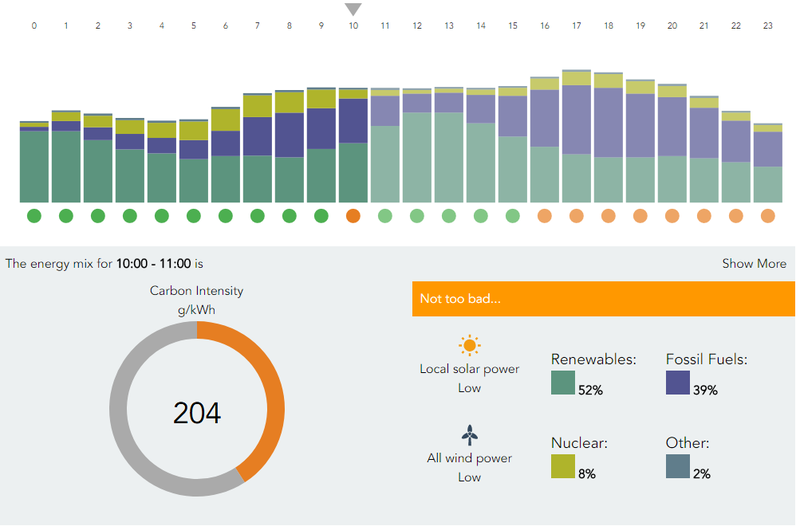 Below each time bar on the graph is a coloured circle which reflects this indication of carbon intensity and matches the colour indication on the forecast and history screens. You may notice that the bars on the graph to the right of current time are displayed fainter than those to the left of the current time. This is because the details for times after NOW are taken from forecast information and so are less accurate. One interesting feature of the graph is that the renewable generation (green coloured part of each bar) can be seen to rise from 9 am to a peak around noon and falls back again to a similar low value at about 5 pm. This is a reflection of the solar power contribution to the energy being generated at this location which kicks in after sunrise, rises to a peak at local noon and falls off as we approach sunset. The high renewables at the left were observed to be the result of good levels of wind generation after midnight, though this had reduced through the night when it was checked. From Spring through to Autumn, the solar contribution (only where solar generators are connected to the local network) can be very much larger than in winter. Solar generation does reduce, sometimes significantly, in cloudy weather so watch out for this too. There is no solar generation when the sun is not up. You can follow these sorts of developments for yourself, so enjoy using the Carbon Tracer App.